Integration Solution Provider Vastiq Solutions is proud to announce it has been recognized with a Best Project Achievement Award from Panasonic Malaysia, for its design work with security manufacturer TDSi on an integrated security project for Telekom Brunei’s (TelBru) mobile network. The project saw Panasonic’s I-Pro Series CCTV IP cameras integrated with TDSi’s access control systems, VUgarde video management software and Texecom intruder alarms. The project ensures the safety and security of TelBru’s network of mobile telecoms masts and installations. Jayendan Jothi Kandan,Director at Vastiq Solutions commented, “We are delighted to have been recognised by Panasonic Malaysia. Two phases have been completed for TelBru, which now protect 54 sites across the country." IP CCTV cameras monitor each site and integrated access control ensures only authorized individuals or teams can enter. The security team monitors/controls everything via a secure online portal using TDSi’s powerful EXgarde security management software. This reduces the need for human security teams to continually visit each remote site, yet gives instant alerts of any suspicious activity, providing both live and historical data for compliance and security reviews. TDSI (TIME AND DATA SYSTEMS INTERNATIONAL LTD).Manufacturer TDSi has been at the forefront of the access control and integrated security management market for 35 years, with a diverse and comprehensive product range encompassing Access Control Systems, Biometric Readers, Security Management software and IP CCTV Video Management Software. 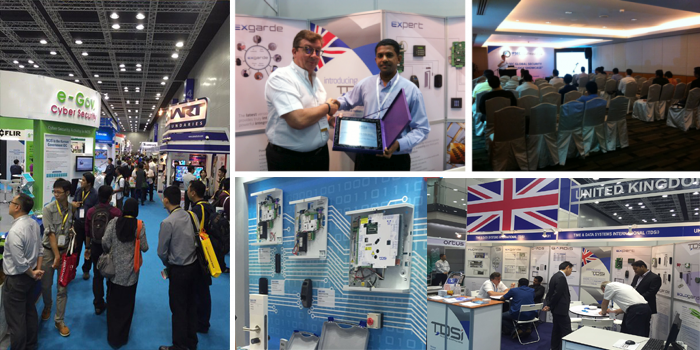 IFSEC Southeast Asia 2016 this coming 7-9 September 2016 at Kuala Lumpur Convention Centre to learn more about CCTV, Surveillance, Fire Alarms / Detection, Cyber Security, Access Control, Parameter Protection, Biometric and more! Witness the latest product available in the market, showcase by more than 350 world-renown brand on the show floor. Join more than 10,000 trade visitors and grab the chance to meet and network with industry's experts and bellwethers.